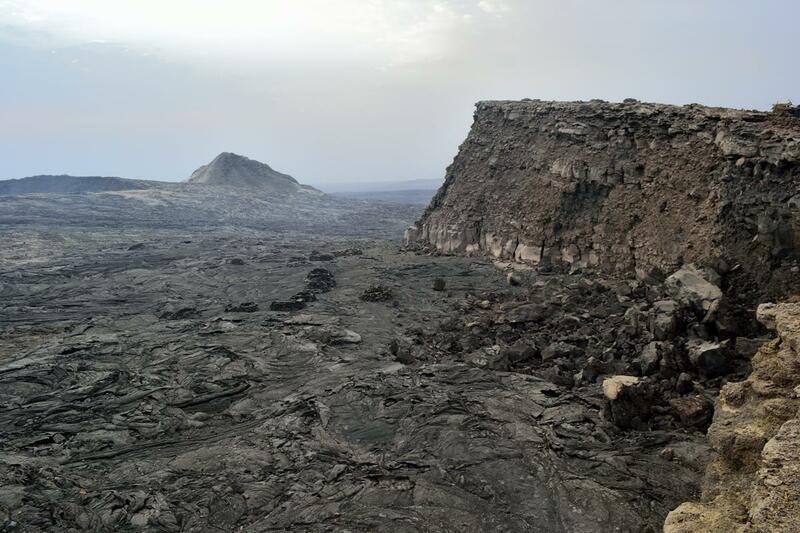 The journey to the Erta Ale Volcano started from Abaala as an easy drive on the newly tarred road leading to the Djibouti border. We stopped in Erepti to pick up two armed policemen and shortly after passing several road blocks we began to realise that it would be virtually impossible for independent travellers to visit this volcano, at least without being fleeced. Gradually the landscape turned into rugged black volcanic rock and when we lunched in a crude shelter at Kisrawate (-47 m), the temperature was again 46 degrees with a hot wind raising dust. Nevertheless the ETT cook managed to produce a great meal in these most basic and uncomfortable conditions. Here an armed tribesman from the Afar community joined our party. As we left the hard pack, we started to realise why our guide had been concerned over the ability of the Hilux to make it. The ETT Landcruisers raced over the flat desert, the first in line taking the road and the others fanning out on either side to avoid the huge clouds of billowing dust. Having little clue where to go, we did out best to follow vehicle No. 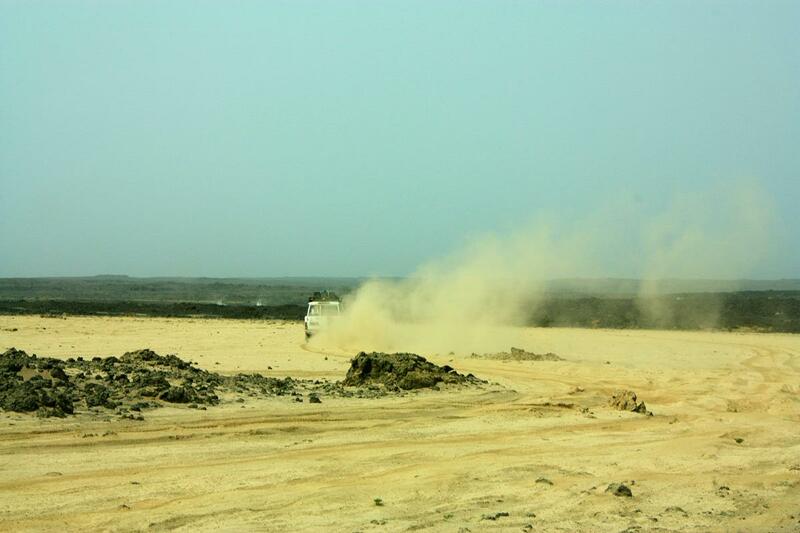 1 as instructed, but at times the dust was so thick that we couldn’t see the end of our bonnet and feared a collision if our leader bogged down in the thick sand. We also fanned out, gunning the engine to keep moving fast, whilst keeping a sharp eye out for dangerously obscured water channels. Following vehicle number one in clouds of billowing dust. We pushed on towards Araboro, a cluster of round wooden shelters and the last village before Erte Ale, where another armed tribesman with a Kalashnikov assault rifle joined us. Picking up an armed tribesman in Araboro. We were barely comfortable in the cab with the air conditioner on flat out. When the aircon cut out periodically from overload we could again not imagine how people live in these harsh conditions. 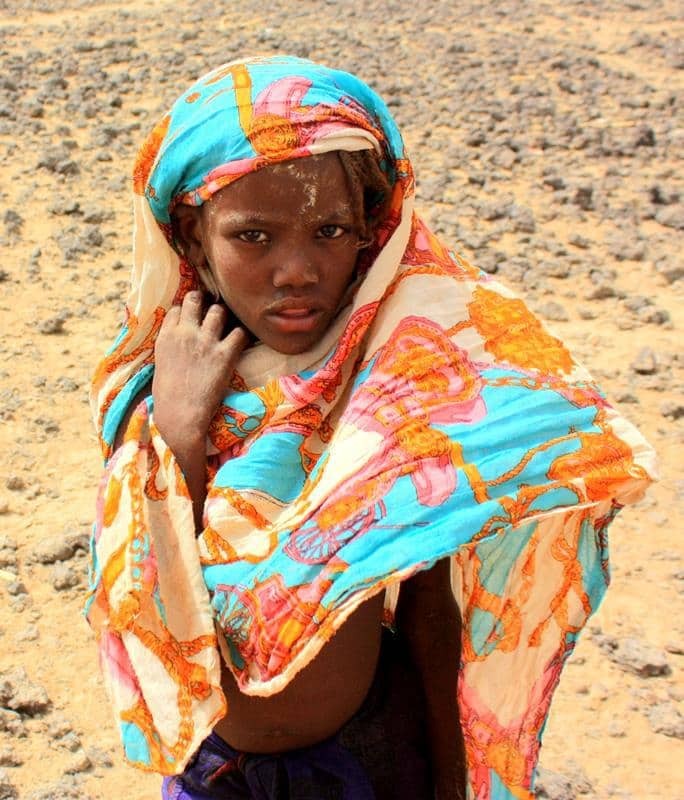 A little girl from the Araboro village. From Araboro we started the last 12 km to Dodom in 4WD low range, never making it out of 2nd gear, over sharp lava flows and rocks. We took it slowly, feeling justified when we saw that one of the rear shock absorber mounts on a Landcruiser had sheared off. It was still excruciatingly hot and very windy when we arrived at the Dodom army camp in the late afternoon, where we rested in the lee of shelters and waited for the temperature to drop to 43 degrees before we could start the 9km hike at 18:30. 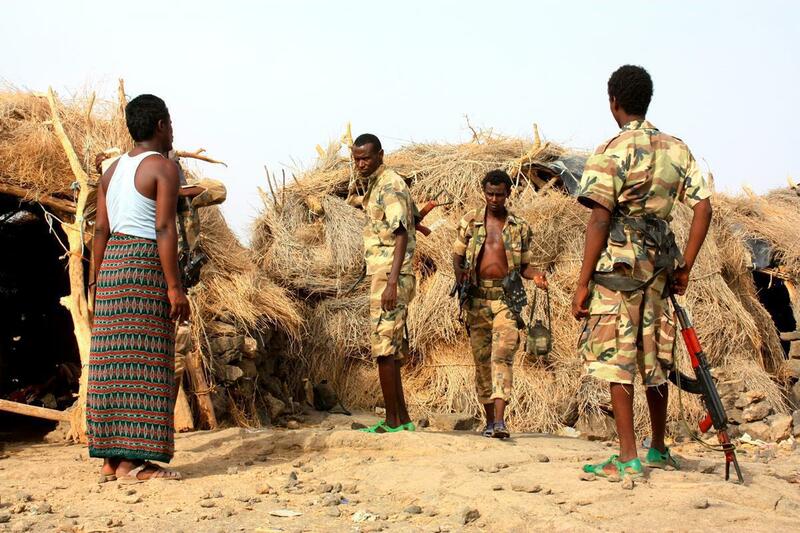 Soldiers in the Dodom army camp. As three soldiers from the army camp now joined us, we had seven armed guards. 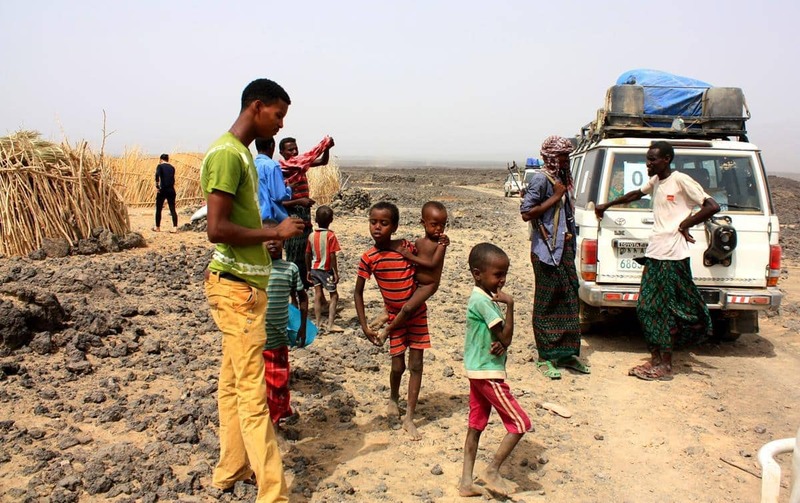 Whilst the fierce Afar tribesmen have a history of attacking visitors into this region, the main reason for these security measures is because five tourists were killed by Eritrean gunmen at the volcano in 2012 and four others kidnapped. 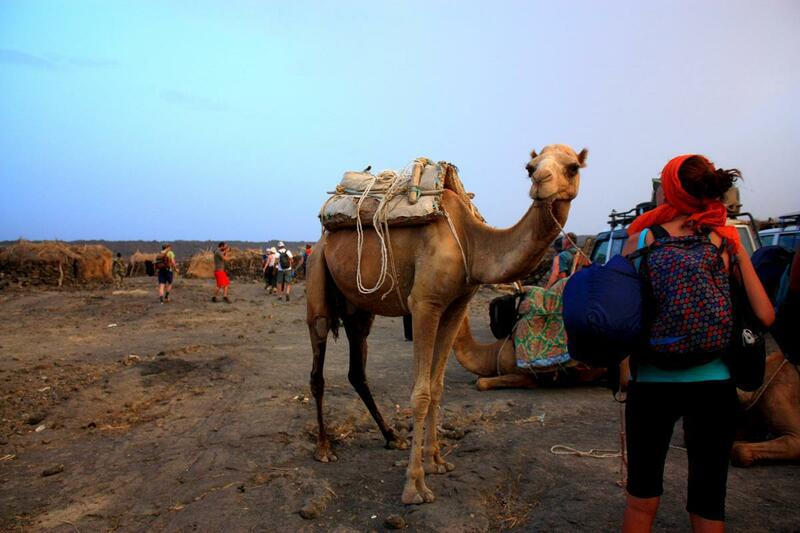 As soon as the camels arrived, we were ready to start the hike to the volcano. We ascended in the pungent slipstream of two camels, each carrying members of our party. We were pleasantly surprised when it cooled down marginally on climbing towards the orange glow emanating from the lava lake. Despite that, two women in the group suffered badly from heat exhaustion and most of us felt that it was a challenging hike. However, after three and a half hours, on reaching the summit, fatigue and discomfort were temporarily forgotten. 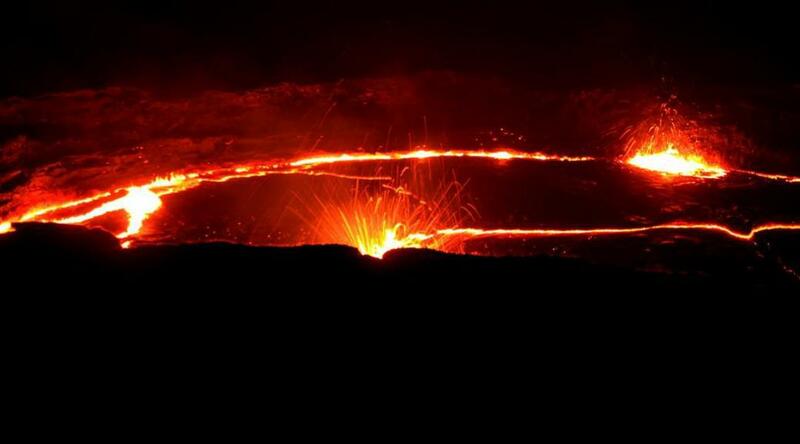 Erte Ale, with a base diameter of 30km and a 1km caldera at its summit, erupted in 1967 and contains the world’s only permanent lava lake. The main pit crater is about 600m above sea level and is 200m deep and 350m across. 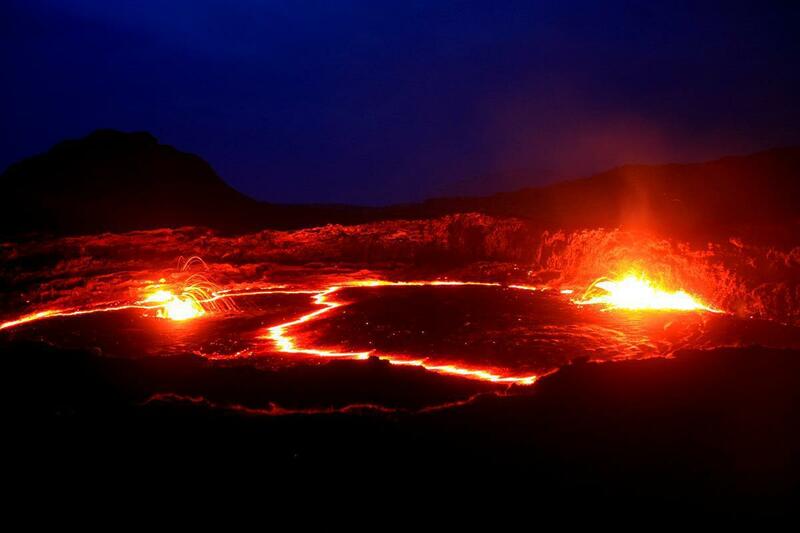 The lava lake itself is contained by its own smaller crater, about 120m across and perhaps 10m deep. The lava lake is contained in a smaller crater within the big crater. It was the most incredible experience to stand on the rim of this live volcano in pitch dark, staring at the illuminated gases blown away by the hot wind. Once all had gathered we edged down the cliff path into the crater and walked to within a metre of its lip, taking care not to break through any thin crust and keeping away from any hot vents we felt blowing on our legs. One could feel the heat blast from the molten rock, hear the throaty exhalations as gases broke its surface and smell sulphurous whiffs wafted in by the cross wind. 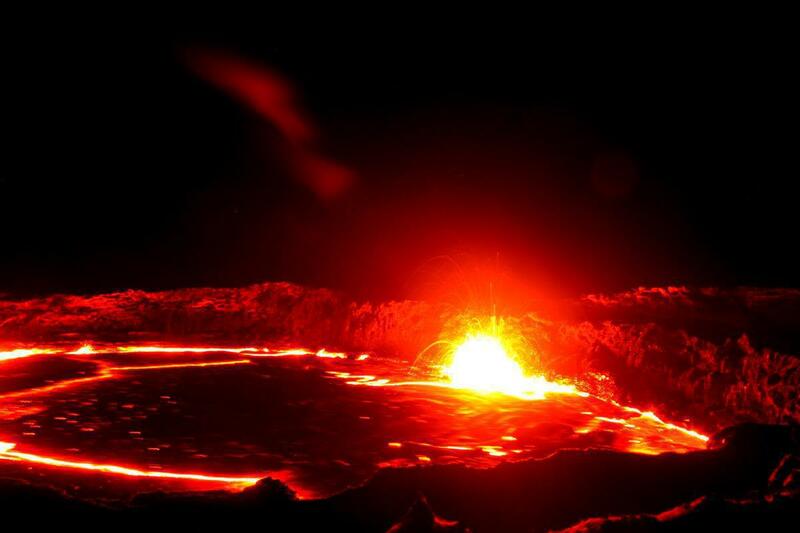 The thick lava spurted up and subsided in several places along the edge of the crater, and, in the red glow we could see the thin black surface crust shifting laterally, mimicking the earth’s tectonic plate movement as it floated on the lava. 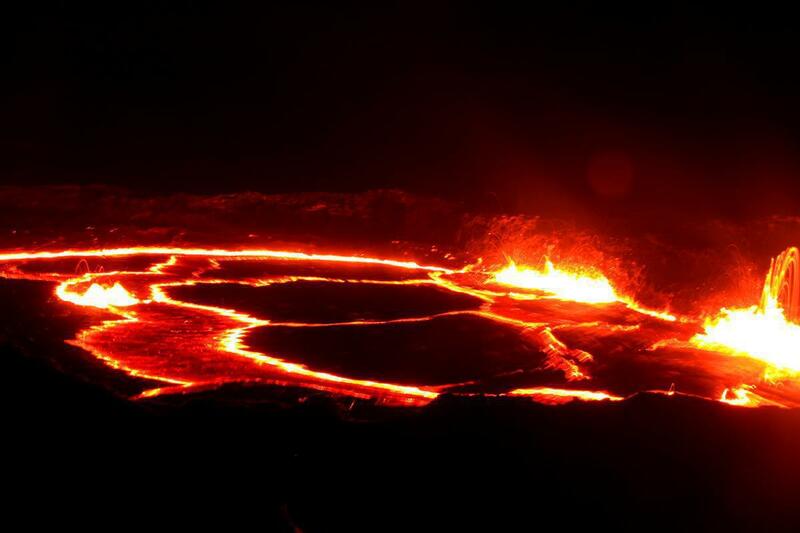 Adjacent areas of crust, each delineated by curved bright red seams, would move towards each other and once the pressure had built up enough, the molten furrow would boil open along its length, engulfing the edge of the crust, sucking it down into the lava. A fist sized rock thrown onto the crust remained where it had fallen. A sea of hot lava and fireworks. Mesmerised, our allotted hour passed quickly. Then at 12:30 and summoned for ‘dinner’, we climbed from the outer crater to the ‘camp’ perched on its edge for egg flavoured rice and hard rolls. We ate sitting on our thin, dirty mattresses spread out on a reasonably level earth, enclosed by a thin, roughly stacked wall of rock half a metre high. Greedy mice dashed onto our plates to steal rice grains, appreciating the extremely plain fare more than us. We were told that all toilet activities had to take place down hill, as an Italian visitor answering a call of nature had recently fallen to his death when he stepped into the abyss of the crater. All exhausted, we lay down at 01:00, shifted the odd stone from underneath and fell asleep immediately in spite of sweaty, filthy clothes and bodies. Our guide awoke us at 04:00 to see the volcano and softly illuminated surroundings as dawn broke. The crust of the lava lake was clearly visible In the morning light. We had to descent steeply into the bigger outer crater before we reached the inner crater with the lava lake. We spent an hour and a half, again entranced, before starting the hike down to the army camp, the latter portion of which was in baking sun and hot as hell! We were all pretty exhausted and ravenous on arrival, feasting on eggs, pineapple and pancakes with a choice of honey, peanut butter and nutella chocolate. 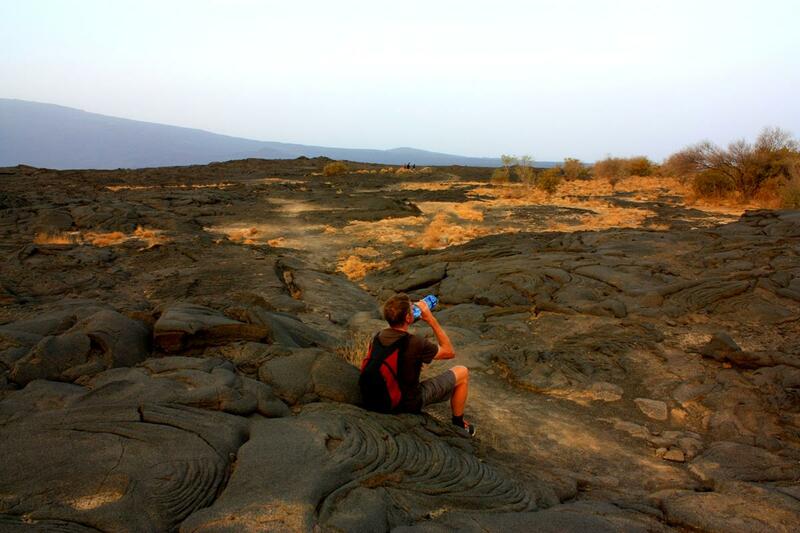 We passed by interesting lava rock formations on our way down. After we donated the contents of one water tank to the soldiers, our stomachs full and with the air conditioner thankfully operational again, we inched our way out of the lava field, basking in a warm glow of satisfaction, knowing that we had done something totally unique. We agreed that this was the highlight and most extraordinary experience of our trip, and amongst the greatest of our lives. Hi Karen and Peter, hope you are all fine back home. 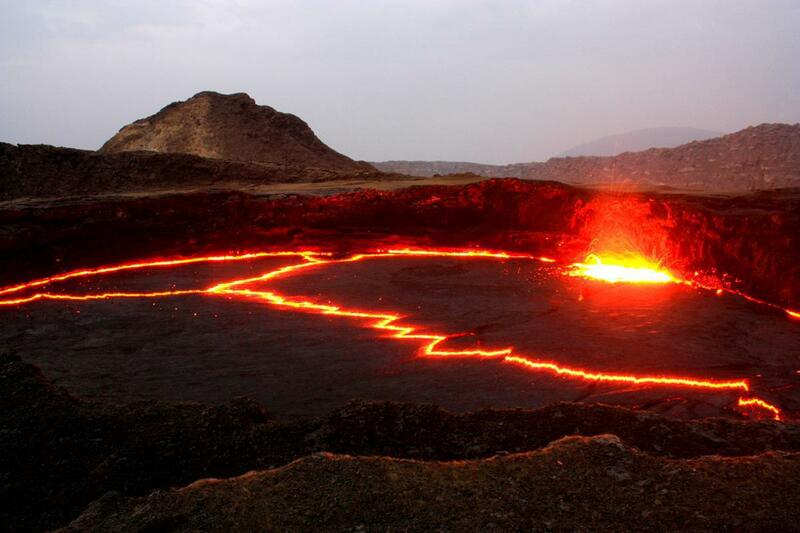 I am accessing your great report on the Danakil now as we are making our way south and anticipate self-driving, also with Ethiotours, on the 25/10 all things being equal. Right now back in Khartoum and turning south to Ethiopia again, tomorrow. 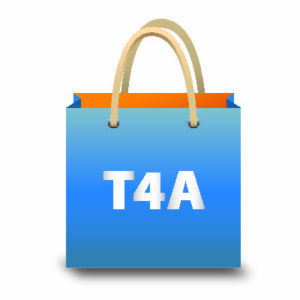 Thanks for the guidance and the great report. Hi Pete /Karin , Amazing, really enjoying your experiences from my armchair, I think it would l be a bit too adventurous for me . Look forward to your next exciting instalment . Keep safe . Roger. Thanks for the wonderful story and the amazing photos! We like the “slip stream” race and the “Nutella”. What a privilege to experience.